Here I have compiled a list of 5 free Android apps to improve accents. These apps will teach you how to speak different accent sounds like short vowels, long vowels, etc. These apps come with different games like exercises that will help you in learning different accent sounds quickly. Some of the apps included in my list will even teach you about the exact mouth and tongue position while speaking out an accent sound. 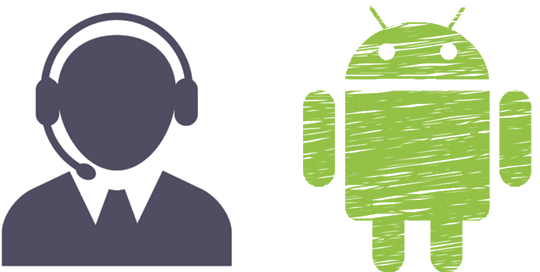 Most of the Android accent trainer apps included in this article will teach you about the British and American accents sounds and you can always switch between them through the app preferences. Also See: 4 Best pronunciation software for Windows 10, 5 Free websites to learn pronunciation, Improve English accent with AccentSchool. English Pronunciation is a free Android app to improve accents. This app provides you the interface from which you can work on your pronunciation skills and make them better. You can learn how to perfectly speak vowels sound, double vowel sounds, voiced consonants, and consonants sound in British and American accents. You can choose whether you want to learn American Accent or British Accent. 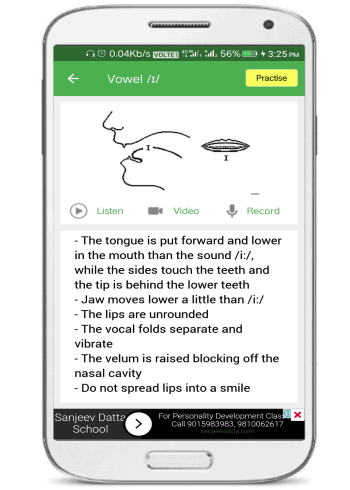 This free Android accent trainer also provides video tutorials from BBC (YouTube) which explain the mouth and tongue positions while speaking out a particular accent sound. In addition to this, the app also shows multiple examples of an accent sound which you can listen. There are 4 types of different exercises in the app for practicing accents pronunciation. These exercises will check your voice pronunciation quality and how familiar you are with different accent sounds. In one of the exercises you will be asked to speak the pronunciation of the displayed word and then the app shows the rating (out of 3 stars) of your pronunciation. The app comes with a very intuitive interface. On its main screen you will see 44 different accents sounds like long vowels, voiced consonants, and others. Select any accent sound and the app will show you how to pronounce that accent sound. You can also see the diagram which depicts the exact movement of mouth and tongue while speaking out an accent. If you don’t get anything from the diagram then don’t worry, the app also provides accent tutorials. Watch these video tutorials (around 1 or 2 minutes long) and play different in-app exercises to improve your accents. I will recommend you to learn one accent sound at a time and then move to the next accent sound. English Pronunciation Practice is a free Android app to learn English accents. This is a very simple app which provides a number of different lessons to practice accents sounds. Basically, in a lesson, the app will speak words, phrases, or sentences and you have to repeat it afterward. The app then shows the part of a sentence with Red color where you miss-pronounced an accent sound. Do note that not all lessons are provided for free in this app. However, you can unlock a premium lesson for a day by watching a video (advertisement). The lessons in the app are divided into 3 categories i.e. Simple, Dialog, and, Paragraph. Open this app and select a lesson under any of these categories to get started. After that, the app will speak a sentence and you have to repeat the sentence by holding the mic button. As I mentioned, the app then displays the sentence and marks the part of a sentence in Red font where you commit a mistake in speaking up a word or words. This app is perfect for practicing, but there is nothing much in it which directs you to speak an accent sound perfectly. However, the app can be put to good use if you want to analyze your pronunciation. Sounds is an another free Android app to improve accents. You can listen to different British and American accents sounds on this app and practice them through different in-app exercises. The app is also available for iPhone and you can read its detailed review here. The app simply shows an accents chart from which you can listen to their sounds and examples. After you are familiar with different accents sounds you can practice with different in-app exercises. There are 3 different types of exercises in the app i.e., READ, WRITE, and LISTEN. In the READ exercise, you will be shown an accent pronunciation and you will have to write the respective correct word. Next, in the WRITE exercise, you will have to spell the pronunciation of the word shown by selecting the accents displayed on the screen. As compared to these exercises, LISTEN is the most interesting, in this exercise, you will listen to a word and you will have to spell the pronunciation of that word. English Pronunciation Training is another free Android accent trainer. From this app you can learn how to pronounce different sounds like R sound, TH sounds, voiced and unvoiced sounds, and others. 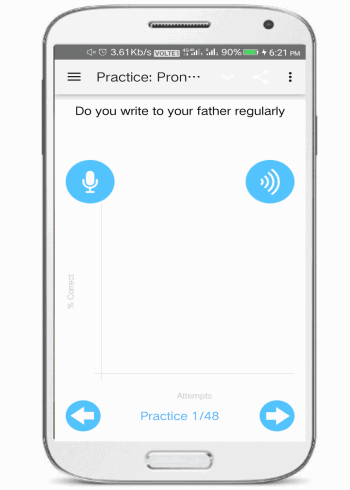 Apart from that, you can also practice and analyze your pronunciation with this app. 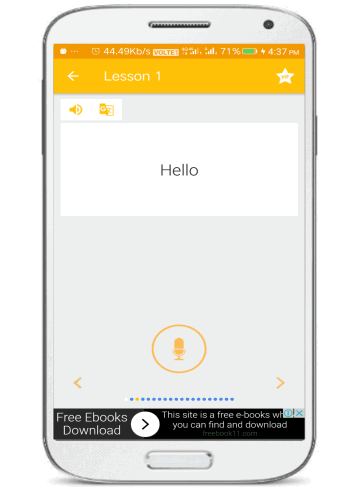 The app comes bundled with a number of different lessons which explains how you should speak a particular sound. The lessons coherently describe the movement and exact mouth and tongue position while speaking. As I mentioned, the app can also analyze your pronunciation and show rating based on the correctness. In the practicing exercise, you will be shown a sentence and you will have to speak it. After that, the app displays the rating and the words spoken by you. 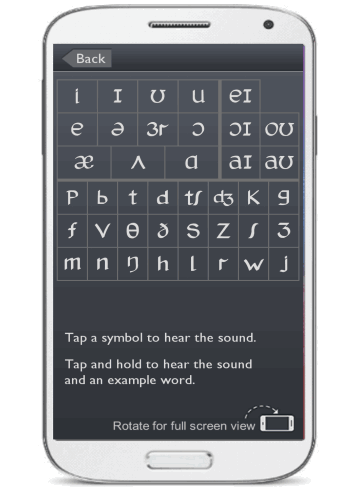 Phonemic Chart is another Android app that can help you to improve accents. This app simply displays an accents sounds chart from where you can learn about different accents sound. Just tap on any accent sound to listen to its pronunciation and see the words that contain that accent sound. This is a very simple Android app which can help you to quickly get familiar with different accents sounds. However, there are no in-app exercises to test and analyze your pronunciation. You can use this app in combination with any of the other apps mentioned above. If you are a non-native English speaker, then these 5 free Android apps will help you improve accents related problems. These apps will teach you how to speak different accents sounds in British and American accents. I really liked the English Pronunciation app as it shows exactly how to speak an accent sound and provides 4 different type of exercises to practice. If you are an iPhone user instead, then you can go with Sounds.